This is an advert for Crufts dog show. The Crufts show is named after its founder Charles Cruft. He was an ambitious man and rather than entering his families jewellery business he became a salesman for James Spratt who sold dog biscuits. He travelled across Britain and Europe and helped to organise the dog show at the Paris Exhibition in 1878. He returned to England and managed the ‘Allied Terrier Club Show’ at the Royal Aquarium. 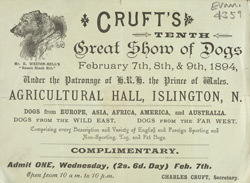 The first ‘Crufts’ show was at the Royal Agricultural Hall in 1891. He made a considerable amount of money from it and it became an annual event.